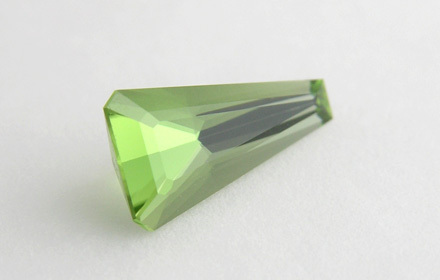 Weight: 0.57 ct; size: 8.60 | 4.40 | 3.11 mm; shape: coffin; colour: medium slightly yellowish green; very slightly greyish; clarity: eye clean; cut: excellent; treatment: none. Very clean specimen; excellent step cut style. Source: Jeffery Davies, Jeffery Davies Fine Jewelry & Gemstones.